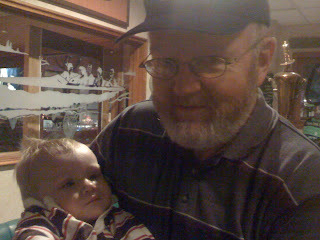 Timmy enjoyed hanging out with Uncle Adam. 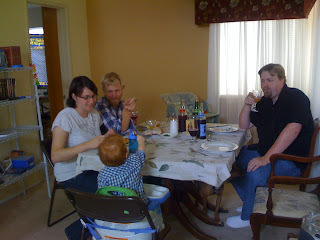 We are so thankful that Marshall's brother and his family could join us for Thanksgiving! It was so fun! We miss them already! 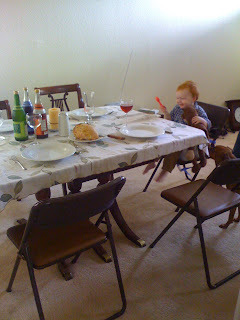 Our nephew got to be the first one to be seated at the table. We had all of the traditional Thanksgiving food: turkey, stuffing, mashed potatoes & gravy, spiced cider, sparkling juice, strawberry pretzel salad, green bean casserole, etc. 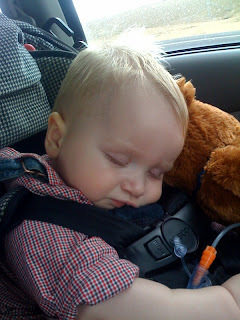 Sadly, the visit with the mitochondrial disease specialist resulted in no new information. So far we have tested for the most common defects in the mitochondria — and they all came back negative, no problems found. This means that we have a rare case of an already rare disease. The doctor recommended another set of tests that would be more invasive than the ones Timmy's had so far. If we decided to go ahead with those, they could all be done at once, which would be good. Mostly it depends on how determined we are to know precisely which part of Timmy's cells is broken. The tests will most likely not help Timmy at all, but they may give us a better idea of how likely it would be that future children would have the same problem. It's a tough decision. On our way to see the specialist at the mitochondrial & metabolic clinic. Whew! That was hard work! 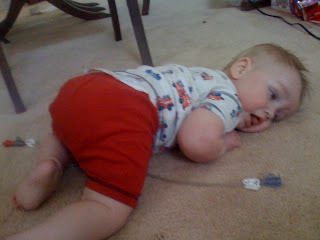 Even though he doesn't have the strength to hold up his head and torso, Timmy was working hard trying to crawl a little. 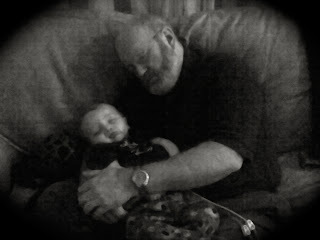 We drove down to Murrieta to visit with Uncle Ron and Mary yesterday, and it wiped us right out. One thing that we did while Grandpa was here was drive up to Lake Arrowhead Village and eat at Woody's Boathouse. We all had a great time playing together this week. 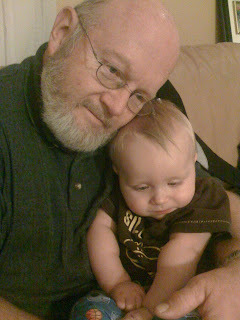 We were sad to see Grandpa leave this morning. We are praying for safe travels as he has a long day of both flying and then driving back to Western NY. 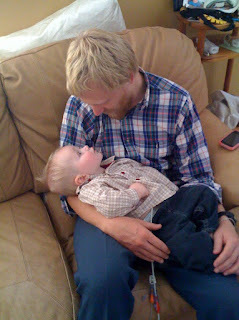 In these last days we have really been enjoying our visit with my dad. He and I were able to play some violin/ cello duets for Timmy. We think he liked it, but it's hard to tell. Dad has also been a fabulous help at fixing random things around the house. The toilet doesn't leak anymore, there are energy efficient light bulbs in place, and the carpet tacks that used to stick out and hurt our feet have been removed — just to name a few things. Medically speaking, Timmy is doing pretty well. He tested negative for the urinary tract infection. He has seemed pretty weak lately, but I think it is improving. And despite the weakness, he seems pretty comfortable, although somewhat melancholy and not terribly interactive. We got a couple little giggles out of him today, which he has not done for weeks. Those little giggles are just really good for the soul. 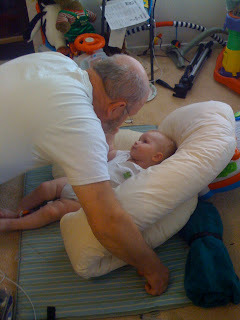 He continues to be doing well in tolerating his formula and continues to be free from vomiting. We had a great meeting with the GI doctor this week; within the next few weeks we will be trying flax seed oil to help his immune system, and we will be trying out a toddler formula next month as well. Our nurse had jury duty today so I'm hoping she doesn't get picked. I need her!! precious window of opportunity, the meltdown that followed was just not pretty, and sleep was even harder to come by. So this change is really helping my stress level. I wonder if the reduction in the number of meds is helping, or if it is simply that he is growing. It's hard to say. 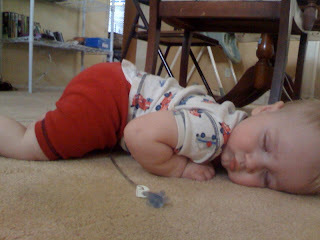 We worked on range of motion stretches today in PT and it was so relaxing that Timmy fell asleep. 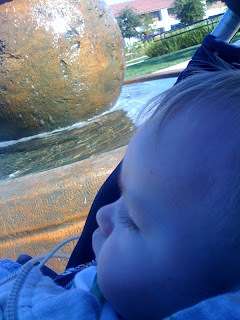 So I put him in his stroller and we sat beside a fountain for some R&R. Mama just got some books from Papa in Chicago and has one all ready. What a treat! Found in our garage: Motorola hands-free cellular phone earpiece. If it belongs to you, let me know. 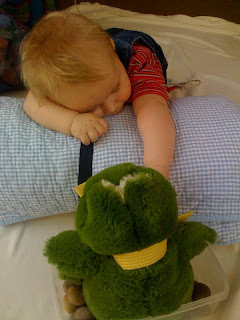 Lost: Timmy's blue hand splints and his blue and brown bolster pillow. If you have been around our house and happened to have seen either of these, please let me know. I use both of these with Timmy every day, or would if I could find them! Being able to express emotions is something that we just take for granted. It has been an odd journey watching Timmy as he has seemed to gain and lose and occasionally gain back the ability to do things like cry, smile, and laugh. A lot of times it's his eyes that tell the most about what is going on inside that little head. If he is really upset, you will see his whole body tense up and his back arches and he really moves around - but all you hear is the movement and some grunting. If you tickle him, the response varies from an actual giggle to a somewhat happy sounding grunt. If he likes something, there are periods of time when he will smile about it, and other periods of time when the smile doesn't get any bigger than the Mona Lisa. You can see in his eyes and in the corners of his mouth that he is considering a smile, but you never really see the full thing. Right now he isn't smiling much, but interestingly we are starting to see a few signs of crying. A couple of times now Timmy has made a brief crying sound in his sleep. And several other times in just the last day or two he has pursed his lips like a baby bird and let out a little cry. Today when the nurse arrived and Brutus barked at her, Timmy actually cried about it. In other news, Timmy is growing like a little weed. 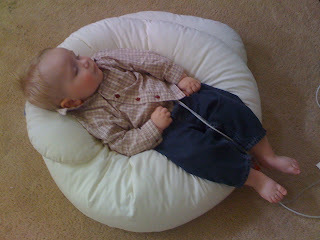 On Sunday when he woke up, he seemed to have suddenly moved up to the next clothing size. His body strength is pretty good and I am considering trying to see how he will do being propped in the pack and play like I used to do. The nurse comes 2.5 days a week and is a great stress reliever. 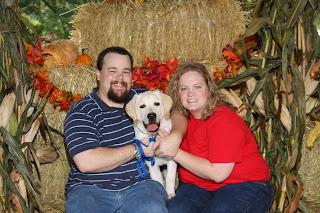 Some awesome things have been happening in our marriage, and I am just so thankful for that.